Discover how the DRA can help “Fast Forward” your business in 2018 – providing vital tools for restaurant owners & operators! A must-attend interactive educational forum for restaurant operators. Join us as we provide the innovative ideas, current industry information, and best practices vital for success in a cultural-shifting and ever-changing landscape. Hear from top industry experts and those who “do it best” – tips and tools for maximizing your business and protecting your bottom line. #NOT IN MY RESTAURANT – Sexual Harassment and Other Trending Topics in Labor Litigation – could it happen to you? Will a New DE Food Code Make HACCP Plans a Requirement for Your Restaurant? 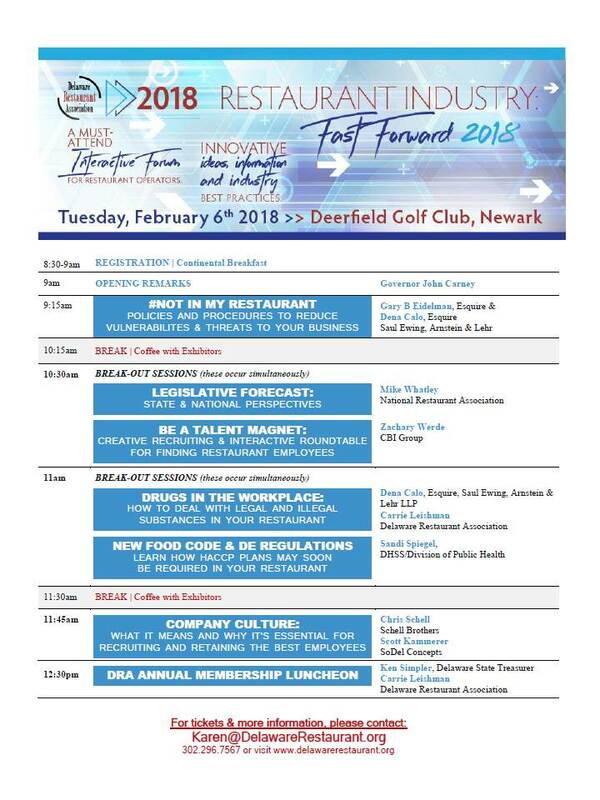 The day will begin with a continental breakfast, followed by the educational presentations, smaller break-out session, networking with Allied DRA Members…followed by the annual DRA Membership Luncheon, featuring keynote speakers Ken Simpler, Delaware State Treasurer, and DRA President & CEO Carrie Leishman. Maximize your event experience by bringing multiple managers & key operators in your business, as some sessions will occur simultaneously. ** Please include attendee names in the NOTES section for all online orders. There will be no physical event tickets, but all attendees will be checked in as they arrive.